I had the Little Professor, and man I LOVED it. It was like a calculator, but it asked you the questions. And if you got the answer wrong, it said "EEEEE." The guy's little mustachioed face always cracked me up. I had the one that looked like an owl with two different colored eyes. If you got the answer right, the green eye lit up; wrong, the red eye. Much less traumatizing than the professor. I had one too! 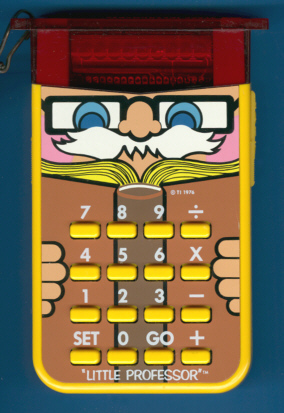 I was always frustrated that it didn't double as an actual calculator, too. Remember Merlin? I wore the buttons out on that game. I wanted to buy one of these for my kids, but was in sticker shock when I went on EBay. My sister had one. Either the owl or the professor. There was another trivia type game, too. I loved them.